This entry was posted on April 15, 2011 by will. The old saying goes, first impressions count - and the same could be said for first impressions about your home. Naturally one of the first things people see is your external doors. If you feel your old home needs updating, renovating or simply a facelift then a great place to start is with the front door. Today - a wide choice of styles to fit your taste are available with more choices of material. A classic, and possibly the most stylish and timeless option - is a wooden exterior door, in particular oak external doors. Whether it’s a front or back door you are after, oak external doors will fit your needs perfectly both aesthetically and safety wise. Solid oak external doors are popular, primarily because of the way they look and feel. Traditionally, they convey warmth and provide a feeling of heavy sturdiness. Naturally finished oak external doors, with decorative glass are among the most elegant and timeless. How you finish a solid oak external door is really up to you, they can be either stained, oiled or painted. Oiled being both a classic and contemporary finish and look. 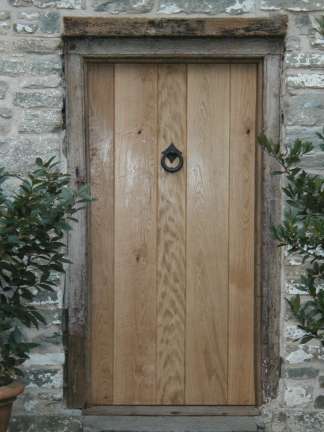 Oak front doors are also extremely secure, weather tight and sturdy. Oak doors are very hardwearing and provide great security to your home. External oak doors weather very well, if you treat them with the correct finishes, in particular specalist external door treatments they will withstand the UK elements for years to come. External doors range from contemporary doors to traditional and are the perfect finishing touch to any home. Add modern glass strips or windows to the oak front door to create a modern look or simply choose a non window option or use leaded glass to create a more period look. Oak external doors with large glass panels are also becoming more popular as they allow light into the property, creating a light airy atmosphere in your home. Solid oak is a popular choice for wooden exterior doors because of durability and it's resistance to pressure, something that wooden exterior doors encounter regularly. Oak comes higher in strength-in-bending tests over other woods like Ash. Another reason for oak's popularity is the fact that it is decay-resistant and resists moisture very well. Oak external doors are the ideal finishing touch to your home. In particular if you also add internal oak doors, your home will have that unbeatable touch of class and elegance. External and internal oak doors are easy to install and hang and can be finished to perfection with either period door knobs, handles or latches or contemporary handles and levers. For a back door option, why not try a stable door? Stable doors make an ideal backdoor, keeping dogs outside whilst letting the warm sunny weather in! Stable doors are a must for any country home. So, treat yourself to some solid oak front doors and be the envy of the neighbourhood. Treat the external doors with quality oak external door finishing products and they will serve you well!